The Swedish Bandvagn 202 All-Terrain Vehicle aka Bv 202, is the grand father of a family of Amphibious Armoured All-Terrain Vehicles developed by Volvo. The principal design feature is the use of long, wide rubber tracks that act as a large surface thus distributing the vehicles weight preventing it from sinking (AKA low ground pressure) in snow, wet marshy conditions and sand, hence the title of “Amphibious Armoured All-Terrain Vehicle”. The front contains the driver (front left) & commander, whilst the rear is either used as the principal troop compartment (8) or used to house specialist equipment. Both sections are articulately joined allowing them to be steered / move vertically and horizontally. The articulated joint serves as the power link for the rear troop section. The Mk1 Bv 202 is powered by a 91 bhp Volvo B18, the MK2 by the 97 bhp B20. 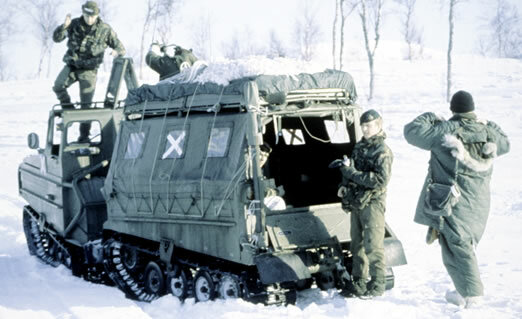 It’s production spanned from 1964 to 1981 and thou it was developed for the Swedish Army to transport troops through the snowy and boggy in the North of the country, it served with the British Royal Marine Commandoes for many years as well as other countries. It’s replacement was the Bandvagn 206, manufactured by Swedish firm Hägglunds Vehicle AB, which has since been acquired and merged with a number of other companies.